In a previous post, the skeptical cardiologist pontificated on the causes and evaluation of the most common cause of palpitations: premature ventricular contractions or PVCs. The vast majority of these common extra beats turn out to be benign (meaning not causing death, heart attack or stroke), and most patients with sufficient reassurance of this benignity (often accompanied by significant caffeine reduction), do well. These people usually continue to notice the beats either randomly, or with stress, but they recognize exactly what is going on and are able to say to themselves “there go my benign PVCs again,” and aren’t worried or bothered. A small percentage of patients that I diagnose with palpitations due to benign PVCs continue to have symptoms. Part of my initial evaluation involves checking potassium, magnesium, kidney function, and thyroid levels. Low potassium levels (hypookalemia) have been clearly associated with an increase in ventricular ectopy. Patients who take diuretics like hydrochlorothiazide (HCTZ, often used for high blood pressure) or furosemide (Lasix, often used for leg swelling or heart failure), are at high risk for hypokalemia with potassium levels less than 3.5 meQ/L. Hypokalemia can also develop if you are vomiting, having diarrhea, or sweating excessively. There are lots of other infrequent causes including excess licorice consumption. The body regulates potassium levels closely, due to its importance in the electrical activities involved in cardiac, muscular and neurological function. The normal range of potassium (K) is considered to be 3.5 to 5 meq/L , however, I have found that PVCs are more frequent when the potassium is less than 4. Most of my symptomatic PVC patients with potassium less than 4 find significant improvement with potassium supplementation. I usually give them a prescription for potassium chloride (KCl) 10-20 meq daily to accomplish raising the level to >4. potassium you consume in your diet. Most patients I talk to about low K immediately assume they should eat more bananas, but lots of fresh fruit and vegetables contain as much or more K than bananas. 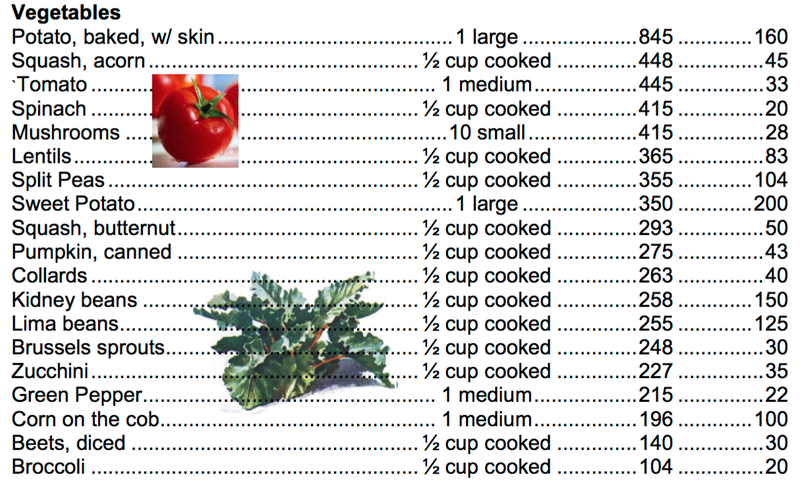 The charts to the right show that a medium tomato contains as much K as a medium banana with a third of the calories. Avocados are a great source of K and contain lots of healthy fat. Yogurt (and I recommend full fat yogurt, of course) is a great source as well. It’s probably time I revealed that I have PVCs. I feel them as a sense that something has shifted inside my chest briefly, like my breath has been interrupted, like my heart has hiccoughed. If I didn’t know about PVCs and hadn’t made the diagnosis very quickly by hooking myself up to an ECG monitor in my office, I know I would have become very anxious about it. I know exactly what causes them: stress and anxiety. And this is the case for many patients. Stress activates our sympathetic nervous system, causing the release of hormones from the adrenal gland that prepare us for “fight or flight.” These hormones stimulate the heart to beat faster and harder and often trigger PVCs. I rarely get PVCs these days, as the major source of stress in my personal life has gone away. This is also a typical story my patient’s relate: troubling palpitations seem to melt away when they retire or change to less stressful occupations, or as they recover from depression/anxiety/grief related to death of loved ones, divorce or illness. You can’t always control external stresses, but several factors in your lifestyle are key to managing how those stresses activate your sympathetic nervous system and trigger troubling PVCs. : good food, good exercise, good sleep and good attitude. Cutting back on caffeine and alcohol, looking critically at the dose of exercise, going to bed on time, and smiling are all great strategies for PVCs. Of these four table legs, I consider regular aerobic exercise the most important, and modifiable factor for PVC reduction. Aerobic exercise improves mood and increases the parasympathetic (the calming component of the autonomic nervous system) activity, while lowering the output of the sympathetic nervous system. Beyond sleep and exercise there is a plethora of techniques that purport to help individuals deal with stress: yoga, meditation, and progressive muscular relaxation, among them. Apps touting methods for relaxation abound these days. My new Apple Watch is constantly advising me to engage in a breathing exercise for a minute at a time. I don’t find any of these techniques helpful for me (I haven’t found a good way to shut my brain down without falling asleep), but they may work for you. Patients will find that the internet is rife with stories of how this supplement or vitamin or herb dramatically cures PVCs. You can be assured that a sales pitch accompanies these claims and that the snake oil being promoted has not been proven effective or safe. Because symptomatic PVCs like most benign, common and troubling conditions (lower back pain, fatigue, and nonspecific GI troubles come to mind), are closely related to mood and wax and wain spontaneously; the placebo effect proves powerful. In such conditions, snake oil and charlatans thrive. Step 10 (a): Please don’t beat me up on this one. Some patients report benefit from magnesium supplementation. I have found it helpful in my case of atrial premature beats. Let me repeat, I am not promoting supplements. Healthy patients with benign arrhythmia might try taking magnesium, especially at night. Don’t take magnesium if you have kidney disease. And if you take too much, watch out for diarrhea. (magnesium) Deficiency is related to atherosclerosis, hypertension, strokes and heart attacks. Deficiency symptoms include insomnia, muscle cramps, kidney stones, osteoporosis, fear, anxiety, and confusion. Low magnesium levels are found in more than 25 percent of people with diabetes. But magnesium shines brightest in cardiovascular health. It alone can fulfill the role of many common cardiac medications: magnesium inhibits blood clots (like aspirin), thins the blood (like Coumadin), blocks calcium uptake (like calcium channel-blocking durgs such as Procardia) and relaxes blood vessels (like ACE inhibitors such as Vasotec) (Pelton, 2001). Magnesium levels are very important to monitor in hospitalized and critically ill patients, especially those receiving diuretics and medications that can effect cardiac electrical activity. However, for individuals with normal diets and palpitations due to PVCs, there is scant evidence that it plays a significant role in cardiovascular health. The MAGICA study looked at supplementation with both magnesium and potassium (in the active treatment group, daily oral dosing consisted of 2 mg of magnesium-dl-hydrogenaspartate (6 mmol magnesium) and 2 mg of potassium-dl-hydrogenaspartate (12 mmol potassium) daily. The dose was chosen to increase the recommended minimal daily dietary intake of magnesium (12 to 15 mmol) and potassium (20 to 30 mmol) by ∼50% in addition to usual diet ) in 307 patients with more than 720 PVCs per hour and normal baseline K and Mg levels. The patients receiving magnesium/potassium supplements showed a decrease of 17% in frequency of PVCs but no improvement in symptoms. A 2012 study in a Brazilian journal evaluated magnesium pidolate (MgP) in 60 patients with both PVCs and premature atrial contractions (PACs). The dose of MgP was 3.0 g/day for 30 days, equivalent to 260 mg of Mg elemental. 93% of patients receiving MgP experienced improved symptoms compared to only 13% of patients recieiving placebo. Both PVC and PAC frequency was reduced in those receiving MGP, whereas they increased by 50% in those receiving placebo. This small study has never been reproduced, and the main results table makes little sense. It would not have been published in a reputable American cardiology journal and cannot be relied on to support magnesium for most patients with benign PVCs or PACs. A small percentage of my patients require treatment with beta-blockers which reduces the effects of the sympathetic nervous system on the heart. Very rarely, I will use anti-arrhythmic drugs. And every once in a while, very frequent PVCs resulting in cardiomyopathy require an ablation. Previous PostBeware The Bitter AlmondNext PostAre You Paying More For Rosuvastatin (Generic Crestor) Than Brand Name Crestor? Since the beginning of the year, I have been experiencing some occasional palpitations. So. last weekend, when I started feeling them again, I used the AliveCor Kardia monitor on my wife’s iPhone to collect an EKG. And sure enough, every time I felt a palpitation, I saw an unusual pattern in the EKG. I then Googled “EKG Images” and found a trace with the same pattern as mine: it was a PVC. Since I follow this blog, I wasn’t alarmed by this information. But, to be safe, my wife made an appointment with a cardiologist here in Atlanta. She also prescribed a stress test and ultrasound the following week which, I assume, is all part of the baseline process. Is this standard procedure? Thanks for your comments, Wally! I too am impressed with your utilization of your wife’s AliveCor monitor and self/Google diagnosis. I don’t view moderate alcohol consumption as a significant trigger of PVCS you will be happy to hear. Amlodipine is a direct dilator or arteries and as such can cause a reflex increase in the heart contractile function and general sympathetic tone. This may make patients more aware of their heart beat in general and of PVCS in particular. A switch to another antihypertensive might improve the frequency of the PVCs or make you less aware but you should understand that this is not improving your cardiovascular risk profile and would only be for symptoms. There is strong evidence that for hypertension, beta-blockers are associated with a higher stroke risk than other BP meds. I have a theory on why this is which I will write about some day. Beta-blockers also have ED, sleep disturbance, depression, fatigue, and asthma as potential side effects. Diuretics are very effective as a second agent for BP. They can lower K however so you would need to monitor your K and keep it over 4 by diet or supplements. Dr. Pinski tweeted me that 8 ozs of V8 contains 960 mg of K by the way. The tests you describe are appropriate as long as they are read by an expert and not “botched” yielding false positives and dangerous down stream testing. Do not have a nuclear stress test.! I have Premature Atrial Contractions with occasional AFib, does the PVC information apply to PAC’s? I take 36mg of Metoprolol & a low dose asprin daily. I stopped alcohol & cut back on caffeine, but still have the PAC’s, although not as bad. You give such great information that is hard to get out of my cardiologist. Premature atrial contractions are similar to PVCs except that the extra beats are coming from the atria. They are very common in the general population of individuals with normal hearts and most people don’t feel them or are not as bothered by them as much as PVCs. With a PAC although the heart beats prematurely, the normal sequence of electrical activation (first atrium, then ventricle) and the normal electrical conduction through the ventricle is preserved, thus the hemodynamic consequences are much less than that of the PVC. There is less of reduction in how much the ventricles pump and less drop in BP. Also, the pause after a single PAC is less than with PVC. There may be more of a role for calcium channel blockers over beta-blockers for symptomatic PACS. I usually think more of lung disease in the patient with lots of PACS. Hi, earlier this year I began to experience quite strong heart palpitations followed by feelings of light headedness which in four instances over 3 days resulted in fainting. I was admitted to hospital and diagnosed with long qt syndrome and put on 20my daily of nadolol (ex. Corgard). My qt.interval was ‘just’ outside normal timing according to my cardiologist and has since fully normalised. Do you have any knowledge in this are area of alternate ways of managing this or any advice for alternate treatments/foods to increase together with the beta blockers? I don’t have any special expertise or experience in Long QT syndrome. However, i do think it imperative that you undergo prolonged monitoring to fully document what your heart rhythm is when you experience the fainting. Hi Dr. Haven’t wrote in awhile on here. Now for pacs that run into afib do you prefer a beta blocker such as propanolo as a pip approach or just an antidepressant to help as well if sometimes they are caused from stress? I hear Prozac was good but also read online it provokes afib. What do you think along the lines for these meds? Doc – awesome site. Just discovered it and I’m methodically reading it all. I apologize if this has been answered elsewhere already, but wondering why you advise to NOT get a nuclear stress test. If your only symptom is palpitations and it turns out to be from PVCs then it is highly likely you have a normal heart and have no high-grade blockages of your coronary arteries. In this situation we do want to confirm normality with something like a stress echo which has good specificity. Good specificity means the test is unlikely to be read as abnormal when there is no problem. Stress nuclear tests, especially if read by radiologists and inexperienced cardiologists have a very high rate of false positives and low specificity. Thus, most of the abnormal nuclear tests for someone with PVCs are not indicative of blocked arteries. Then you end up going down a path of invasive testing with potential complications and with the potential for getting a stent you didn’t really need. On top of that stress nuclears are more expensive and involve quite a bit of radiation. Great site and very informative! I began having frequent PVCs six months ago and went to the emergency room twice during that time, convinced I was having heart failure. However, no test my cardiologist threw at me (Stress Test, Holter Monitor, Chest X-Ray, Echocardiogram) revealed Afib or anything structurally abnormal, other than semi-frequent PVCs/PACs. The stress issue came up frequently, but in my opinion that is just a specious attempt to offload the problem from physiology to psychology. I didn’t need relaxation or yoga, I needed to correct a physical imbalance. Dietary changes (treating the problem like a gastrointestinal/acid reflux problem rather than a cardiovascular problem) and reduced alcohol/caffeine certainly helped reduce PVCs for me, but when I began taking 100mg of magnesium four times a day after reading about it on a forum online, the problem almost completely vanished. Since I began taking magnesium daily my health and well being have ramped way up, and the PVCs have been pushed way down to an occasional blip. I’m glad to see professional sites like this addressing the issue, but from reading widely in the Internet, it seems a lot of people are having this problem and their doctor’s simply do not know how to treat it. What magnisum? I have svt/afib well there still trying to figure out ughhhh!! Dr wants me to try diltizam or ablation. Thanks for your kind words and comments. I tried to address the data on magnesium in the post. I do think there are some symptomatic PVCers who will benefit from magnesium but this is rarely due to a true magnesium deficiency. I worry about promoting magnesium too enthusiastically due to the many snake oil salesmen hyping their proprietary brand of magnesium for everything that ails everyone. What type of magnesium are you taking and why four times daily? Physiology and psychology are closely intertwined by the sympathetic nervous system-it’s very hard to separate them. Of the tests thrown at you I can find no reason for a chest X-ray. I have noticed the weird sensation that you describe in your chest that you are attributing to PVC’s. I have checked my pulse when I feel this sensation and I have 2-3 second pause before it beats again. It is a regular beating pattern with pauses. When I take magnesium on a regular basis I seem to have fewer episodes. I know that low magnesium can be a cause of low potassium. Could it be that when I take the magnesium it is actually improving the potassium level? my desk or laying down at home. Maybe once every couple of weeks. I always feel them when they come. However for the last few days I’ve had episodes that last an hour near bed time or when I wake up in the morning. Tonight they seem more frequent. It’s been three hours on and off with 10-20 a minute. Is it possible for PVCs to be benign at this duration or frequency? Assuming there are no underlying issues causing PVCs, what duration and frequency would you feel warrent a ER visit or the next available cardiology appt.? It is possible for PVCs to be benign at that frequency and duration. Assuming that your heart is structurally normal and that your current symptoms are definitely due to PVCs there is little to gain from an ER visit. However, those are significant assumptions and things change with the heart, so, in general the safest thing to do for any new and worrisome symptom is to call 911 for an ambulance. I’m not advising you do that , just commenting for that situation in general. For my patients, I encourage them to call me with any questions or concerns, and if I received a call from a patient describing what you are describing I would (depending on the time since our last evaluation and other factors in their prior history) likely have them wear a 24 hour monitor and check potassium, magnesium and thyroid levels and see them in office after seeing the results. Thank you… I will follow up with my cardiologist. Turns out for my situation, I had been aggressively treating Psorisis with a lot of Mometasone Furoate… this prednisone derivative seems to be part of the cause…. along with stress…. which typically causes psoriasis issues for me. I have given you articles to my PA as he tells me a lot of his patients come in for PVC. Topical steroids are designed to have minimal systemic uptake but it is possible a high potency topical steroid could have systemic effects. My Dr. referred me to your website after my frequent complaints of pvcs. After reading this page I asked my Doctor to check my potassium levels, and guess what….they are low! They have always been low, and currently they are the highest they have ever been at 3.9. I picked up some 99mg potassium citrate today in hopes of getting my levels higher, and ultimately eradicating these darn pvcs. My question is this: the pharmacist told me to take 1 pill, every 2 days. Is that enough to get my levels back up? I usually prescribe potassium chloride (KCl) for patients with low potassium that can’t increase it by eating more foods with potassium. Typically we start with 10 Meq. Potassium citrate 99 mg contains 2.5 meq of elemental potassium (divided 99 mg potassium by the atomic weight of potassium 39). So to get 10 meq you would take 4 of those potassium citrate tablets. You may need more or less than this. I am presuming your doctor has verified that your kidney function is normal. The only worry with potassium supplementation is in patients with kidney dysfunction where levels can get too high if supplemented. Levels should be rechecked after a week of supplementing because everyone responds differently. There’s a variety of magnesium supplements and a ton of snake oil salesmen hawking and trying to support their own particular brand. In the medical field we tend to prescribe 400 magnesium oxide and we see levels come up with that nicely. Since each individual reacts differently I suggest you find a cheap OTC version of magnesium that works for you. Thank you for your posts. They are, as others have said, comforting. Wondering your opinion on retesting. I’ve had PVCs since I was 15 (63 now) and they have come and gone over the years, attributed to hormones, low potassium, stress, and dehydration/bad diet. Recently they started again and are driving me insane and none of the usual fixes are working. Two ER visits with normal EKGs and my cardiologist all say no worries. I’m thinking maybe I should have another ultrasound, buy MD doesn’t think it’s necessary. I had a perfectly normal cath in 2015 but no tests since. Your thoughts? Thank you. Good question. I consider retesting for patients who have not had documentation of “structurally normal heart” for some time and who have a significant change in their symptoms. You would qualify since no testing in 3 years and worsened symptoms. Typically I would order a stress echocardiogram which allows a reassessment of both LV structure and function and for any blockage in the coronary arteries and I would consider some kind of monitor-a 24 hour Holter would be fine if you are having daily symptoms. You might also consider acquiring an AliveCor device to monitor your rhythm with symptoms. I’ve written a lot about this elsewhere on this site. Unfortunately AliveCor does not identify PVCs but if you connect via KardiaPro with your physician your recordings can be viewed and interpreted by him/her. I’m wondering if you have any insight into this. I’ll try to be brief with my background. I’ve had PVCs for many, many years. I was diagnosed with them by admitting myself into the ER when I was getting a particularly bad string of them about 15 years ago. The doctor hooked me up to a 12-lead EKG and diagnosed me with them, mentioned they were benign, and sent me on my way (NOTE: I do believe I’m going to get an echo soon as they’re still present and I’m not sure a person can really determine they’re benign by just an EKG, no?). In the last three years, I’ve had two kids, moved, and have had a stressful number of situations at work and am finding myself dealing with these dreaded things again, and more frequently. To top it off, I strongly believe I feel each and every one of them. I know many people don’t feel them, but I believe I’m plagued in that I feel it whenever it happens. I’ve almost become hypersensitive to the sensation and sometimes I feel a stress-induced jolt of adrenaline when one happens. Now onto my question: they never seem to happen with exercise, and I can get my heart out of bigeminy (when it does go into bigeminy), by simply moving about. They appear to ease with exercise and return at rest. But the “spells” for me (which can last a day or two and can have a month or so in between) consistently start during early morning hours. It started when I would awake at random times in the night to hand my 1-year-old a bottle. I’d lay back down and “thump”, I’d start feeling them. Now I can just wake up to use the restroom, or just to turn around, and there’s a good chance I’ll feel the dreaded “thump”. If I felt one at night, then during the next day the prevalence of them is a lot higher, as well as the chance of bigeminy. My question is: why the early morning hours? What’s happening here? Is it something with the parasympathetic tone? Sometimes I’ll even dream that I’m having them and then wake up to them. Any thoughts as to what might be going on? Sinus rhythm, 37 – 102 bpm, average 57 bpm. Nocturnal bradycardia suggests high vagal tone and is normal. Patient reported 15 episodes of “heart palpitations”. Out of 15 episodes, most (6/15) were sinus rhythm. 5 episodes recorded one PVC. No sustained arrhythmias seen. No significant pauses (longest R-R interval 1.8 seconds at 1:45 am). As you can see, when I strongly feel something, many times it doesn’t even register as more than sinus rhythm. So the cardiologist thinks I’m crazy and shoos me away. But I can feel my pulse and I am definitely skipping a beat and usually about 15-30 times a day. It is very unpleasant. So here is my question: Since my cardiologist doesn’t even want to consider potassium, medication or anything, I want to try to self-supplement. I bought 99mg hard tablets of K-Gluconate. There are warning signs everywhere I could die. I know you can’t give medical advice here, but what do you think is a safe dose to start with? 1 pill/day, 2? 3? I just want to see if it has any effect at all. And while I know you aren’t a big proponent of Mg, I also bought some Magnesium Oxide pills to go along with it. FYI: I do cardio exercise 3x/week, I don’t drink alcohol or caffeine and I eat a very healthy balanced diet. I also sleep 7-8 hours a night. Lifestyle is not a big factor for my problem, I think. Thank you again for all the wonderful information here! It is appreciated. Your question about potassium supplements is a really good one and prompted me to dig around a bit to give an informed answer. Lots of my patients are on potassium supplement pills because they are on diuretics like furosemide (Lasix) which causes potassium depletion. For these patients we typically dose with prescription strength KCL at increments of 10 meq. 10 meq KCL=750 mg and these are large pills. We carefully monitor potassium levels in the blood in any patient receiving potassium pills. Potassium gluconate by weight is mostly gluconate. When you say 99 mg you are referring to the mg of potassium, usually in a 595 mg K gluconate. this would provide 99/39 (molecular weight of potassium) or roughtly 2.5 meq. It would take 4 of these daily to equal the typical supplement dosage that I prescribe. The warnings about potassium are because if you have kidney failure, potassium levels can rise to dangerous levels. Another thing to keep in mind is that there are reports of potassium supplements damaging the lining of the esophagus so it is important to take potassium pills with a large amount of water and it would be better to divide up the doses. I’ll publish a post on potassium supplements as time permits. Another way to supplement potassium is with “salt substitutes” like Nu-salt or Morton’s salt substitute. A brief look into this , however, tells me that it is a very complicated field. The best way to raise potassium levels is by eating foods with good potassium levels which I believe I listed in the post. I have no idea if I am having PVCs or not. I’m currently out of the country traveling and these just started 2 week ago. I am a non-smoker, moderate drinker, walk 1 hour per day, don’t drink caffeine or sugar drinks. I was diagnosed with a hole in my heart 3 years ago but no treatment was required. I am on 25mg of Losartan for high blood pressure but it’s been under control for years now and I am being tested again to see if it’s needed. I had all the heart tests 3 years ago with all coming back fine. I did have a severe 2 month diarrhea cycle recently which is now making me feel like this caused me to have low potassium? Could this have triggered PVCs? What to do till I get home? (In Mexico). PS no pain, no dizziness…normal symptoms. THANK YOU!! Most forms of Magnesium supplements are barely absorbed by the body. Magnesium oxide is practically worthless, and is also the most commonly form prescribed and used. Re-Mag kills my PVC’s without loose stools, but nothing else does (cheated from work…but only at levels that cause diarrhea). Thank you for this informative article, especially the part about foods rich in potassium. I did find it helpful to eat a tomato every day! Is there a connection between benign PVCs and inherited peripheral nerve disease (charcot-marie)? . I have both. Thanks again. I found this article today after googling magnesium and PVCs. I’ve had benign ectopic beats for the last 5 years, and they cause me a lot of stress sometimes. I just try to ignore them, but the last two days, they’ve been worse than ever before. And then I took liquid magnesium citrate last night for a different problem entirely, and the palpitations just…stopped. Like went from worst ever to nothing within an hour. They’re still gone today, almost 20 hours later. I’ve never heard anything about magnesium helping palpitations until now, but it was such a dramatic effect that I, of course, had to google it. I’ve already been on the phone with my cardiologist’s nurse to ask if it’s okay to take a magnesium supplement every day. I hope they don’t think I’ve been listening to quacks or anything…it was truly an accidental (and happy) discovery, and I just really, really hope that the effects are consistently reproducible for me. I’m trusting this is a real experience in which case I say, hooray! I’ve been researching a separate article on magnesium supplements, hoping to clarify which are most effective with least side effects. Mag citrate, of course, is traditionally used in bowel preps prior to colonoscopy to clear things out. Did you get any GI side effects? I have been suffering from benign pvc’s for at least 40 years and have tried nearly every medication that can be prescribed. I am 81 and healthy. I have had an av block and pacemaker fitted( on second one), yet I still get pvc’s or did until 5 weeks ago. This is when I started to take magnesium chelate supplements. I had been following Dr. Sanjay Gupta, a cardiologist from York, in the UK. and reading widely on the internet. Magnesium kept coming up, so I asked my GP if I could try it. He said yes but be careful to consult a pharmacist about the best sort for my condition. The result is, I have not felt any pvc’s. since. I do avoid chocolate, caffeine and any known triggers. My energy levels have increased, my breathing is better and I feel years younger. Magnesium has changed my life. Try it for a few days, like I did. Glad that worked for you. Can you provide details on the dosage and form you are taking? I have been working on a post specifically about the best way to take magnesium supplements. Thank you Dr Anthony, I am using capsules of magnesium chelate, made in Australia with brand name, Nature’s Own, 500 mg,eq to elemental magnesium 100mg. The recommended dose on the bottle for cardio health is one capsule twice daily with food. I must add that I Also take a beta blocker, metoprolol, which I have been on for years, but lately, it had become ineffective in preventing palpitations by itself. I am still taking it along with a blood thinner, warfarin. The addition of magnesium has eradicated the arrythmias altogether, at least for the last 5 weeks and I am hoping I can cut back a bit on the beta blocker. May I also add that my blood pressure is now perfect, according to my GP, and my temperament, according to my wife, is very much improved. My energy levels are a lot better and exercising is much more pleasant, as you would expect. I have always been sceptical of alternative medications and too cautious to try anything other that what a qualified medical doctor would prescribe. That is why I believe it is best to get the OK from your doctor before taking any form of medication. Good to hear magnesium worked so well for you. Magnesium chelate means magnesium plus an organic compound, often citrate. We use mag citrate for constipation and for cleaning out the gut prior to colonoscopy and i can testify that it works really well in that regard. Hi! I’m wondering about your view on hormonal changes and PVCs? My cardiologist said they could be related, without any real explanation. I notice my PVCs much more strongly during and immediately after my period (my intense PVC episodes started 5 years ago at age 35, though I’ve noticed the occasional PVC as long as I can remember). I will then often have 2 to 3 weeks per month that I notice none. Thanks! Well written and informative. I suffer from occasional bouts of PVCs. Thanks for all the tips. Hi Dr. I have had AVNRT and received a cardiac ablation in October 2017. After the surgery, I became very aware of my heart and PVCs. I wore a monitor after the procedure and found out that my PVCs represented a very small percentage of my heartbeats (<3%). However, I do notice an increase in PVCs when I exercise. I believe this is because my heart is more excited during exercise or because I used to get my episodes of AVNRT when I exercised. Either way, I’m always concerned that PVCs will lead to SVT during exercise (I’ve had 3 episodes of AVNRT since my ablation). EKGs and echos have all been normal. Any advice? Most benign PVCs (assuming you have a structurally normal heart and yours are benign) improve with exercise. I have never seen AVNRT triggered by stress induced PVCS. I am 62 and started having PVCs in my 20’s, at which time I saw a cardiologist and assured they were benign. I’ve had them all my life and while I had a stent 2 years ago, it was unrelated to that. So 2 weeks ago I saw an article about taurine and how it can help with PVCs as well as other cardiac rhythm issues. I started taking 1000 mg in the AM and another at night. The PVCs have almost completely stopped. Any thoughts on taurine? I would put taurine in the category of nutritional supplements with no scientific support for efficacy for anything. However, if it almost completely stopped your PVCS that is fantastic for you. Keep me updated on whether it is a durable cure as PVCS come and go randomly often and there may be other factors playing a role. I’m a big supporter of self-experimentation (as along as it is safe) and if an individual finds a particular supplement that cures them of their PVCS without any side efffects (no matter the mechanism) they should go with it but don’t assume it will work for anybody else. I am on Metoprolol for blood pressure and Tachycardia which has helped. Do you think it also can help with PVC’S? I take 100mcg’s daily. Dr. AnthonyP, a recommendation for your magnesium research and documentation, please review the book “The Magnesium Factor” by Dr Mildred Seelig, MD. Look forward to seeing your thoughts. I am very sorry, but perhaps they are not “quacks” for saying Magnesium helps? I suffer serious PVC’s, I have been to cardiologists that are rated as the highest in their field in America and in Germany, 4 times they told me, make sure my Magnesium intake is supplemented. Also, even just today I had an attack of PVC’s, I even thought I might pass out. I took 300mg of Magnesium orally, a powder substance brand that dissolves in mouth, and within 30 minutes, I felt like going for a jog. So, not saying your not also excellent, but maybe, you should rethink Magnesium and not be so closed minded? Magnesium has been my go to for bad PVC days for 2 years and always works. Thank you for the wonderful comments. Its great to know we are not alone in this and we have a Dr. Who makes us feel at ease. Ive had lots of stress lately which brought on plenty of anxiety. This in turn has plagued me with hart palps for the last almost 4 months. Ive wore a 48 hour monitor and had a. EKG and everything is benin. After reading that mag and potassium defitioncies can cause PVC ‘s, I am taking Magnesium Glycinate and take an Adrenal Coctail. 90 % of the skipped bets have disapeared. I am so grateful, its. Like getting my life back. I do still have some throughout the day but .ill take it, because I have tried everything elseto getrid of the.Thank uou for uour time on here. Please let us know when you have new information to share.